Being vegetarian, tending towards vegan (if only I didn't like cheese so damned much! ), it is often difficult to find food we can eat when we touch down in a new city. Not so in Wrocław! Right there in the heart of the Stare Miasto (old town) on the Rynek (Market Square) there is a wonderful 100% vegan place called Vega with 'fast-food' on the ground floor and a restaurant above. They have a wide range of cuisine at value-for-money prices. I particularly liked their samosas. Inside is clean and comfortable, with little nooks where you can chat over a cup of tea and one of their tasty vegan cakes. Here is a sneak at the counter from our place amongst bookshelves of Polish books. There is also outside seating if you want to do some people-watching or soak in the atmosphere of Wrocław market square. 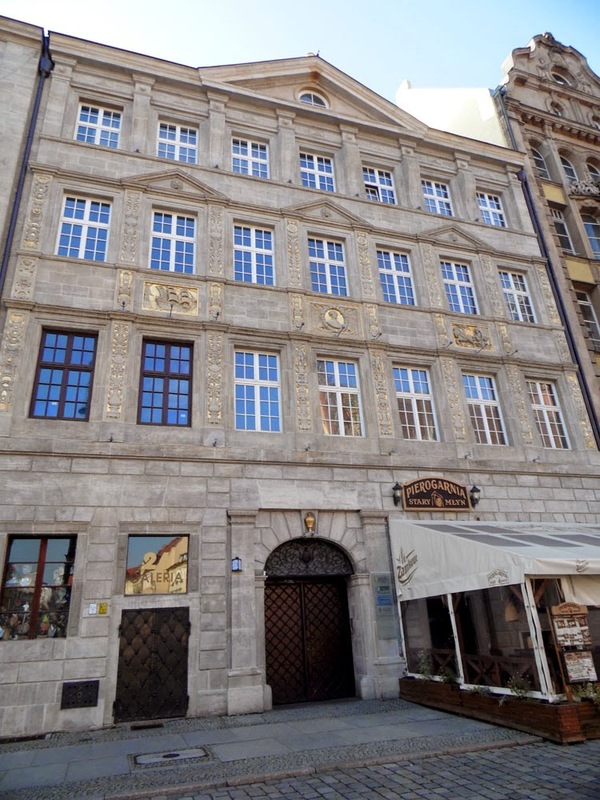 I have written a review of Vega in Wrocław for Tripadvisor, which you can read here. If Vega doesn't take your fancy, then take a short walk from it down Kuznicza street and you will find Green Way on the right. This is a franchise chain of vegetarian fast-food restaurants popular mainly in Poland (why? Open one in Berlin. Now!) which is bright and clean and again good value for money. It is a bit like eating in McDonalds - but without the reek of deep-fat fryers and the sight of obese people stuffing their faces with minced-up dead animals. I'm not prejudiced, oh no! The staff were friendly and helpful: they gave us recommendations and guided us through the Polish menus with English. Here I would recommend the lasagne that I had. I have also written a review of Green Way for Tripadvisor, though they spell it as one word; Greenway. If Green Way is a bit lacking in atmosphere for you, and you are nostalgic for your student days hanging out in small co-operative run vegan cafes whilst planning your next animal-rights march, then my third recommendation for you is a little bit further on down Kuznicza and turn right onto the narrow street Nozownicza. It looks like you've passed into a rather run-down apartment-block area of Wrocław, but don't be put off. On the left side of Nozownicza is the small vegan restaurant called Najadacze. Here is their najadacze.pl website where you can check out the delicious choice they offer. And here is my review of Najadacze on Tripadvisor. Inside though it's décor recalls a rustic farm-house barn. Hearty food, good prices, and a lively atmosphere, though the meals can be a bit slow coming, especially if you order the baked dumplings rather than the ravioli-style pierogi. Here is my review for Pierogarnia Stary Mlyn on Tripadvisor. 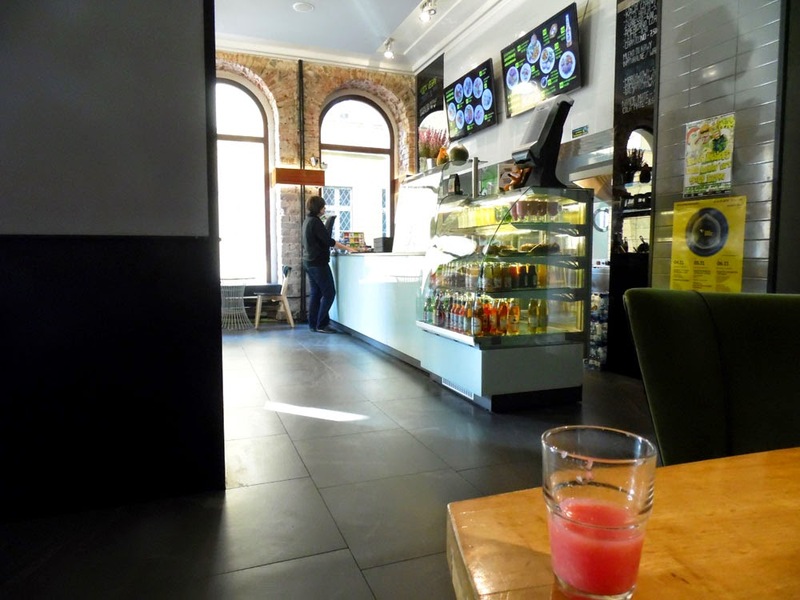 Those are my recommendations for meat-free eating in Wrocław. I must admit it was quite a surprise to so easily find four great places in one town, and so close to the centre. If only Berlin were so well served! 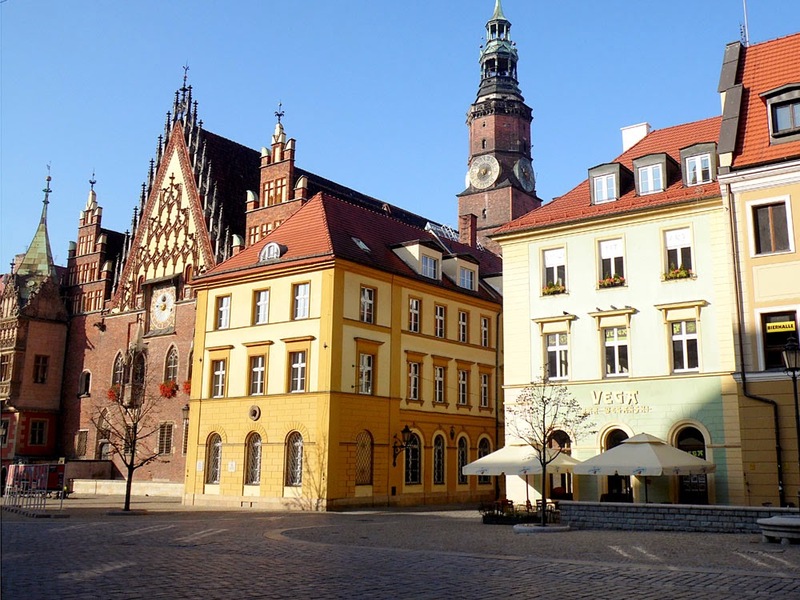 (By the way, if you have stumbled onto this page and wonder why I am writing about Wrocław, Poland, on a blog about living in Berlin, it is because Wrocław is within easy reach of Berlin if you are prepared to bear a four-hour plus bus journey. DB buses leave directly for Wrocław (or Breslau as Deutsch-Bahn call it) from outside the Hauptbahnhof twice a day. Prices vary but always cheaper and faster than getting there by train. 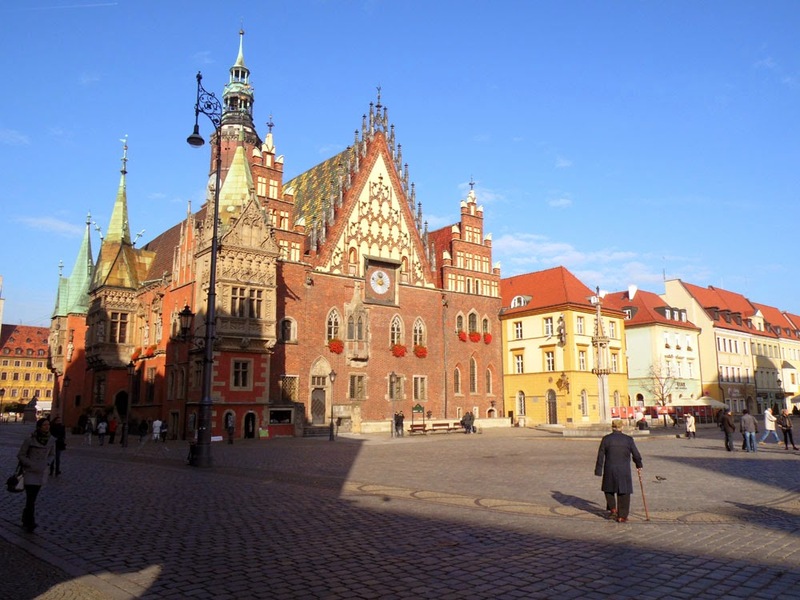 Last week we took the bus and spent a very enjoyable three-night stay in Wrocław).